That is to say: I (sometimes compose and) perform the music, recording my performance as MIDI data (and sometimes editing it in that form). Then, I run the MIDI data through my custom animation software (which generates individual movie frames) and into a synthesizer (and record the output as digital audio). Finally, I put it all together in movie editing software, add titles, and render the final movie. This approach guarantees that the video is in sync with the audio because they're both generated from the same data. However, it limits me to MIDI-enabled instruments and to music I can perform myself. The audio and MIDI data entering the alignment software have same notes in the same order, but with different timings. The MIDI data exiting the alignment software has the same note timings as the audio. From there, the process is the same as it is now: write the animation software, generate the movie frames, add it to the audio, add titles, render. I chose Tarrega's guitar piece Recuerdos de la Alhambra as my first example. There were two reasons for this choice: guitar music should be relatively simple to align, and my friend James Edwards gave me permission to use his recording of the piece. Here's what his recording sounds like: MP3 of opening eight bars. ... and here's what the audio generated from the MIDI version of the score sounds like. As I expected, the MIDI version is much more regular, but a lot of the main landmarks are in the same places. Again, the MIDI version is more regular, but the structure of the two is similar enough to give me confidence. Now, the question is: how to align these? In the last couple of years, I'd seen self-similarity plots for music (for an example, see Jonathan Foote's article Visualizing Music and Audio using Self-Similarity), and I realized that I could remove the 'self-' from this to create a similarity plot for my two audio streams. In this, the most similar (zero difference) is dark blue, with lighter colors indicating less similarity (greater difference). The light lines running vertically and horizontally are where a note onset (positive spectral delta) in one recording is being compared to a non-onset region in the other recording. Where these line intersect is where there's a note onset in both recordings; these points of intersection are darker there because the difference is smaller. In this view, the inter-file alignment will be represented by a diagonal line running from the upper-left-hand corner to the lower-right-hand corner; most of the time, it will pass through the dark points at the intersections of lines. 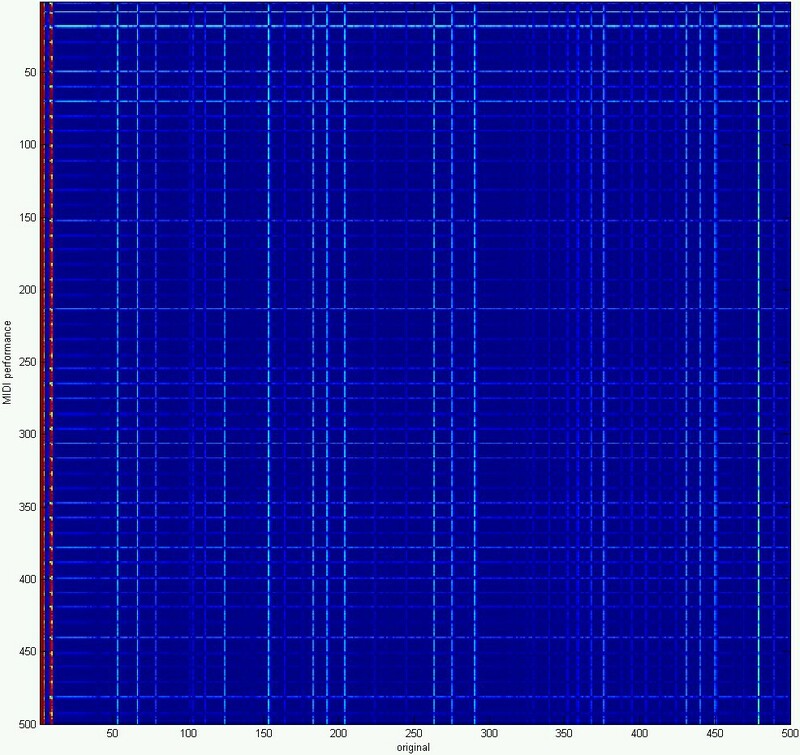 The FFT is "noisier," but in the context of a tool where I can disregard the glitches (since I'll be looking at the images myself — not expecting the software to do all the analysis), I think it's preferable. What FFT should I use? I'm currently considering FFTW and Intel's Math Kernel Library. Intel says that theirs is faster, but it's not free, so I think I'll start with FFTW and see whether it's fast enough. 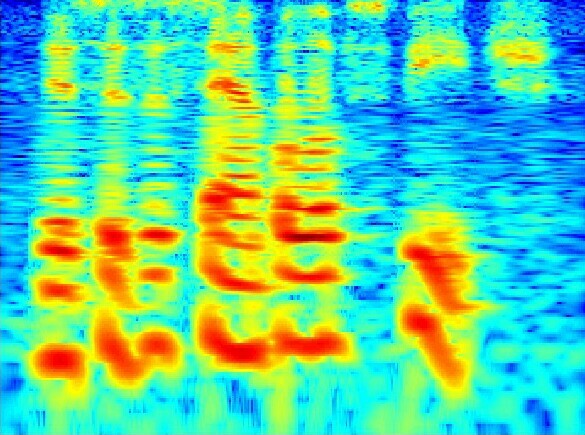 I tried arranging this so that the two spectrograms were more visually equal, but I couldn't figure out a way to do that without violating other constraints. I decided that since the audio was the more "real" of the two (and, as the one that wouldn't be altered, the "foundation"), it should be on the bottom, with time flowing from left to right.